The inventory menu has three main sections - Inventory, Collection, and Map. The inventory lists gear and equipment and displays player stats and hats. The collection section displays treasures and artifacts the player has found. The map section shows a map of the islands the player has explored, and links navpearls to marked locations on the map. 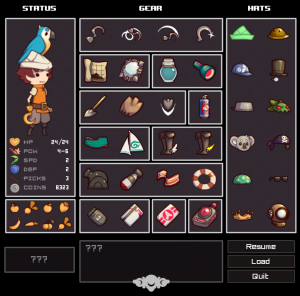 The inventory menu tracks the player's gear, upgrades, stats, hats and boat upgrades. The default keyboard binding to open the inventory menu is either [I] or [ESC]. It's separated into three main sections. The leftmost section of the inventory menu displays an image of Peep and the current hook upgrade and equipped hat. It displays a list of statistics beneath the player based on upgrades and equipped gear. Under stats it shows the number of lockpicks the player has available, as well as coins. Finally each piece of Golden Food the player has collected will be shown - each adding +1 to the player's health. The gear section shows a list of player equipment. At the top are the hook upgrades which have been found. Under that are available tools, and shovel upgrades. Beneath that are books (which effect movement), boat and sail upgrades and equipment. Finally keycards and misc key items are listed. This section lists all available hats the player has collected. The equipped hat can be changed by clicking one of the available hats in this section. 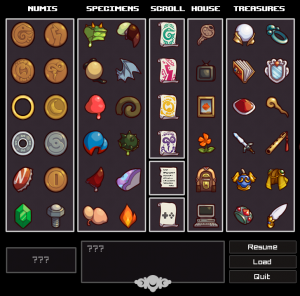 The collection window lists all the treasures and artifacts the player has collected. It's separated into sections by treasure type. The default keyboard binding to open the collection menu is [C]. Numis are a treasure type which can be turned in at the Pawn shop on Daunsal Island. They'll fill up in this section as they're collected. Specimens are collectibles which have a rare chance to drop from specific monsters. They can be turned into the scientist Guy in the GloboCorp Offices in Daunsal City. Scrolls are collectible items which offer lore and background into the history of the world. Main scrolls be translated at the library on Daunasal Island. Finding and translating all four main scrolls will open passage into the Mysterious Temple. 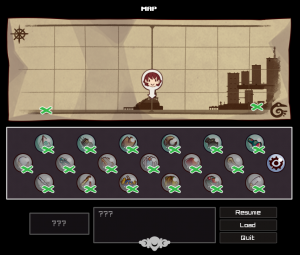 There are also pages of Baggus' Journal which can be collected and a controls scroll which outlines the game's controls. Clicking each scroll in the menu will open it up to be readable. House Upgrades are additions to the house which the player can purchase. Collecting all 12 treasures is the main objective of the game. Each of these treasures has a corresponding navpearl which will mark the treasure's location on the map and alert the treasure finder when the player is nearby. Legendary Treasures can be identified by their large purple-gold ornamented treasure chests. Many treasures require overcoming a puzzle, platforming challenge, or boss encounter. After each treasure is collected it will be displayed in the collection section. The map section shows the game world. Islands which have not yet been discovered are shown as a cloudy area, they fill in with detail once landed on. The position of the player is marked with an indicator. The default keyboard binding to open the map menu is [M]. The map above can be scrolled horizontally. Below is a table listing articles outlining each island which can be explored. Underneath the map are spaces for Navpearls. Each navpearl will appear when found, and clicking it will center the map on the mark where the navpearl's corresponding treasure is located. This page was last modified on 26 January 2018, at 00:47.